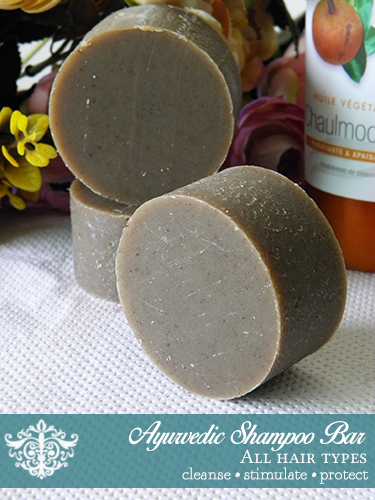 Made with shea & cocoa butter and a blend of ayurvedic herbs for tackling hair loss & promoting hair growth, this shampoo bar is suitable for all hair types, especially those seeking to minimise hair loss. Contents | Avocado Oil (Persea gratissima), Water, Coconut Oil (Cocos nucifera), Castor Oil (Ricinus communis), Shea Butter (Butyrospermum parkii), Cocoa Butter (Theobroma cacao), Sodium Hydroxide, Extra Virgin Olive Oil (Olea europaea), Essential Oils, Chaulmoogra Oil (Hydnocarpus laurifolia), Herbs (Amla, Shikakai, Bhringraj, Yastimadhu, Horsetail, Dhatura Ki Jad), Beeswax(*), Rosemary Oleoresin, Vitamin E.
Packed full of vitamins like vitamins A, E, D and potassium, avocado oil helps to protect and nourish hair. Its fatty acid content is higher than olive oil, making it a wonderful oil to use in hair care products. It also helps to stimulate new growth and unclog blocked follicles. Made of mostly plants native to India, this blend of herbs has its roots in Ayurvedic medicine. These herbs are known for its use in hair treatments, especially with hair loss and promotion of hair growth. Bhringaraj is known as “master of hair” and commonly used to fight against greying hair and baldness, while Shikakai is rich in saponins and help to clean and smooth hair as well as promote hair growth. Amla is rich in Vitamin C and is considered one of the most powerful regenerating herbs in Indian traditional medicine. Originating from India, chaulmoogra oil has long been used in traditional medicine and in haircare, the oil helps to promote hair growth while soothing the scalp. It is rich in hydnocarpic acid (45.76%), chaulmoogric acid (33.26%), gorlique acid (10.95%), making it suitable for those seeking to find relief from dandruff or those who are dealing with hair loss or irritated scalp problems.